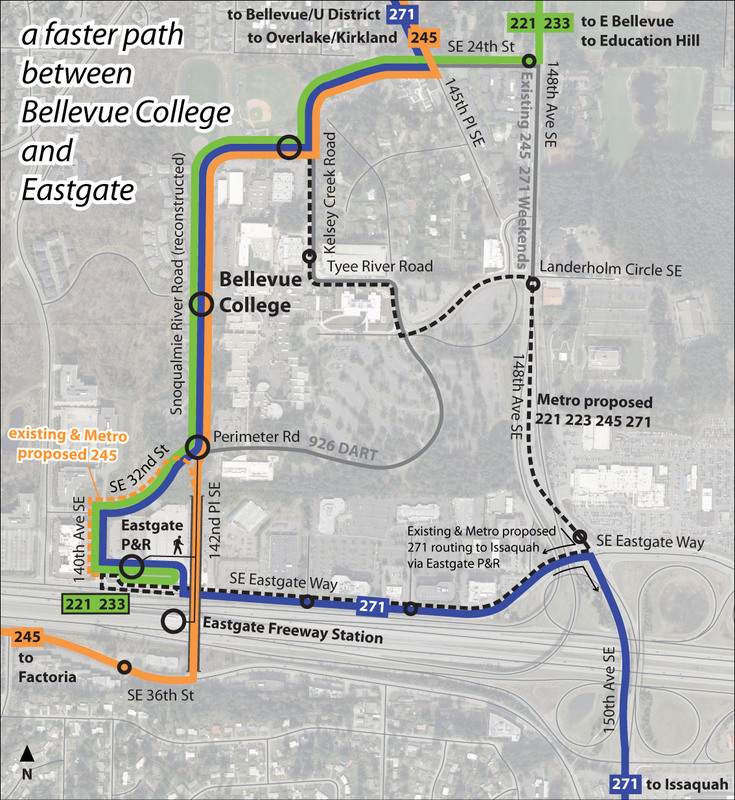 One really interesting component of Metro’s proposed Eastside service revision is the huge amount of service between Bellevue College and the Eastgate Park and Ride. Like many colleges, BC is a big all-day traffic generator, and Eastgate is of course the main access point to I-90 buses for a wide swath of Bellevue. There is a much better way to serve these nodes, but to date none of the involved parties has stepped up with the leadership and capital funding to make it happen. Currently, four routes of varying quality shuttle between these nodes, and revised service would also have four routes, three with 30 minute headways and one with 15. These two major transit hubs are less than a half mile apart as the crow flies. Unfortunately, terrain and the road network make this a very bad connection. Coaches go all the way out to 148th Ave and turn onto Eastgate Way; this amounts to three signalized left turns in the northbound direction, in addition to a lot of added distance. Google pegs this as a 5-minute drive; add time for a bus taking this route. More after the jump. The 926, an hourly DART van likely to be discontinued, takes Perimeter Rd. Although slightly more direct (Google says 3 minutes), this route has lots of speed bumps and in any case cannot support the axle weights of 40 ft. coaches. a 6-minute** time advantage, plus the all-important perception that this is not a milk run. There are lot of people that currently have one-seat rides into Seattle and will now be asked to transfer at Eastgate; making this non-agonizing would be gracious. Passengers on all routes can get off at a new stop at 142nd Pl and Perimeter Rd and have a much easier walk to the freeway station. Furthermore, the stops on Eastgate Way are still served by that frequent 271 on its way to Issaquah. These roads would need to be reconstructed to accommodate buses… The roads would need a 12” concrete subsurface to accommodate the weight of regularly scheduled buses. In addition, bus stops in both directions would need to be added at the intersection of Snoqualmie River Road & Kelsey Creek Road, while eliminating the stops at Tyee River Road & Kelsey Creek Road and at Landerholm Circle SE & SE 28th Street. The intersection of Snoqualmie River Road at Coal Creek Road should also be improved. Today, Snoqualmie River Road is not aligned with 142nd Avenue SE, and the north leg of 142d Avenue SE (which serves a residential area) is too close to Snoqualmie River Road. An additional mid-route stop along Snoqualmie River Road should be considered to provide quicker pedestrian access to housing and campus facilities. The college closes Snoqualmie River Road during evening hours, so the road would need to be opened during a longer time period to serve transit during off-peak hours. The study estimates the total cost at $4.4m. The other problem is condos on the other side of the road, which could mean NIMBYs when the subject is a diesel bus going by every five minutes or so. Of course, no one has any money. The good news is that with so many buses the operational savings are actually significant. The study estimates annual operating savings of $538,000 under route assumptions that place total service at about half of what it actually would be. Exact trip counts for the revised service don’t exist, but using the existing trip counts on the four routes involved, and a commonly cited figure of $125/service hour***, the annual savings come out to $1.3m, recovering the capital cost in less than four years. Put another way, that’s a 30% return on investment forever, before considering any impact on riders. My understanding is that, report aside, this isn’t on anyone’s project laundry list. It’s about time it was. Between Metro, the City of Bellevue, and Bellevue College, someone should take responsibility for this. *Google calls this 142nd Pl SE, but Bellevue documents say Snoqualmie River Rd is the real name. ** Time savings estimate from the Bellevue study. *** On 221, 233, 245, and 271, there are 347 weekday trips, 193 Saturday trips, and 113 Sunday trips. There are 255 weekdays, 52 Saturdays, and 58 Sunday/Holidays in a typical year. The study uses $100/hr for reasons that escape me. What is that “BRT” on the “long range service concept”? 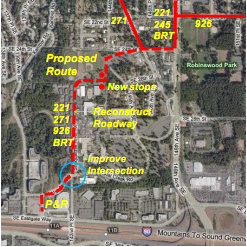 I wasn’t aware of any BRT plans in this part of bellevue. The map looks pretty, but as written I’m unclear what the current routing and station placement is compared to the proposed idea. Maybe it’s because I’m still on my first cup of coffee. Can someone clarify this, or is it just me who’s confused? Existing: Follow the dotted black line from the north, through BC campus down to Eastgate Way then head back towards Eastgate P&R. The 245 then goes up round the hill and across the bridge to the other side of the freeway. The 271 backtracks east along Eastgate to 150 Ave. Martin proposed: thick solid colored lines. The stops are the circles. I’m a student at BCC and I can tell you that the college does not give much damn about public transit whatsoever (just look at how much parking lots they have), on the schedule booklet for the winter quarter, there’s an info page about 520 bridge’s spring tolling, but not a single line mentioning public transit option. And just last summer (2010) they changed the Metro’s system map posted in the hallway dated from 2003, after I wrote ‘out of date’ with thick permanent marker on them. When I transferred there from Cascadia I got sticker shock from the price of their bus pass compared to the U-PASS. You got to give them some credit for offering discounted passes to students. right now it cost $120 and only last through the last day of school, unlike U-Pass that last til the end of the month. This is about the best piece I’ve seen in recent memory on how to be an excellent transit supporter. Kudos to Martin for researching the problem and articulating a reasonable solution that benefits both transit operators and riders alike. Any project that gets 30% ROI is a no brainer in anybody’s board room. Former Secretary of Transportation, Sid Morrison, had a saying. Instead of thinking about ‘silver bullets’ to fix things, think about ‘silver buckshot’. Sometimes lots of little things that fix small problems add up to a greater good than a couple of high dollar mega fixes. Martins’ earned his bus pass for the year, what’s your idea? That $500k annual savings is at the top end of any annual savings. Ultimately it comes down to “do you save a bus?” with the running time reductions. In some cases, you might, in other’s there will be no cost differential. Actual savings are likely less. But still, there should be a decent ROI. Why does existing service swing back out to 148th instead of using the Perimeter Road? I’m guessing there’s a reason. Perimeter Road would be destroyed by anything larger than a van. Perimeter road would be faster than 148th and would “protect Bellevue’s neighborhoods” but would it be worth reconstructing it? Probably not. Martin’s proposal would shave even more time off, have a shorter road to reconstruct, and would provide improved connections. The key would be to get the condo owners bought in to prevent a Surrey Downs-like Jihad against improved transit connections and access. There was a legal battle between the townhouse owners and the college over who owns Snoqualmie River Road. The road was paved temporarily to allow construction of the townhouses and most of it is actually on the townhouse property. The owners were trying to get a fence built along the road in exchange for giving the college a permanent easement. Not sure how they’d feel about rebuilding the road to allow heavy bus use. I hear 2×222 buses go by my house every 30 minutes – The noise issue is real although relatively minor (leaf blowers are *far* more annoying). That said, newer hybrid buses and even those horrible workhorse vans, are *much* quieter. If the road was well-designed, smooth, and with a 15-20mph speed limit, the noise really shouldn’t be a major impact. Same thing here with the 236 and a few peak buses going by my house at about 25 mph. I find the noisy speeders and engine revvers late at night a greater noise and safety concern than buses. It’s not only buses but also cut-through traffic that’ll use the shortcut. I live in a condo pretty close to the 331 and 342, and I pretty much never notice either go by unless I’m listening for them. The noisy car and truck horns on the freeway the better part of a mile away are more annoying. I live right on the 54 bus route with a stop right out front. I do hear the busses stop and accelerate (60 footers), but I just smile and am glad another neighbor took the bus. If we’re talking about rebuilding a road why not Perimeter Road? I’ve never attended Bellevue College but it seems having transit connections actually on campus is a plus. Radar enforcement, possibly with cameras could replace speed bumps. Is there really no reason other than the weight limit (like connecting buses) that the current route jaunts back out to 148th and uses Eastlake. I attended BCC. Both stops are on the edge of campus. That big building on the east of the existing campus stop is a large parking garage and there are no class buildings on that side (save for a room with vending machines which can be used for waiting out of the cold). The bulk of BC’s class buildings are located south of the existing stop. How do the various routes fair with regard to serving the Eastern Washington University branch campus? I’m not familiar with EWU’s operations on the BC campus. The current stop is right in front of the student services building and college administration though. A perimeter road routing would be .7 miles, would have more traffic, and more pedestrian interference since it lies between the parking garage and the college. The turns in the heart of the college and existing speed bumps are tricky to navigate with a bus so we have to go much slower than the speed limit. An advantage of a perimeter road would be that it can use the existing Bellevue College stops. Martin’s proposal would be .5 miles of relatively straight road, with mainly transit related pedestrian traffic. A major advantage would be creating a transit related corridor on the west side of the college that doesn’t interfere with existing car and pedestrian traffic in the middle of the college. Frankly, either option would be preferable to the current situation and result in operating cost reductions. I like Martin’s proposal and believe it is faster. I’d try to sell it to the condo owners but if they balk, a perimeter road routing could be almost as good. Perimeter Road would have the advantage of still serving the southeast part of campus. Most drivers want the buses off the campus. The speed bumps, which keep on proliferating, are a PITA, the inability of the students to pay attention to crosswalks and sidewalks make it dangerous and once they get in their cars they pay no attention to the speed limits. Instead build sidewalks out to 148th, perhaps with covered walkways and put the buses where they belong, on the street. When I went to the University of Illinois we somehow lived with out buses on campus. Just like on the UW campus the mix of students and buses are not safe. Which University of Illinois campus? When I was at UIUC four years ago we most definitely had buses on campus: we had a transit center directly next to the Quad. All the loop-de-loop specialty stops are one of my pet peaves with Metro planning. Bellevue College is one of the most blatant examples, at a place where students would have no problem walking to an on-street stop. As a frequent 60 rider, I just cringe at the expense of having *three* loop-de-loops on our route. One is mitigation to South Park for the county dropping the ball on replacing the bridge. The other two are the turn onto Columbian and crawl through the VA parking lot, and the loop to serve the Olsen-Meyer P&R. What drives me nuts about these stops is that there rarely is anyone getting on or off at either of these stops. I’m not suggesting that VA clients should have to walk all the way to 15th Ave S to get to the bus. The VA has a staff of valets, who could get in a VA-run van and take people back and forth between the on-street bus stops (including for the 36 on Beacon Ave) and the various front entrances, improving the connectivity. Metro could probably save a big chunk of money by subsidizing a couple valet FTEs and lending the VA a van. In the process, the main obstacle to dependable travel time on the 60 (a second-tier trunk route) would be removed. The Olsen-Meyer P&R will, unfortunately, need to be re-engineered to be on the de-facto highway that becomes Roxbury. It won’t be a cheap fix, but it will save over five minutes of travel time on every route that serves the stop. Maybe Kevin Wallace, owner of the apartments-in-the-middle-of-nowhere at the P&R, could pitch in half-and-half to help with the re-engineering project? Forget rebuilding the road; just reroute the buses and let it crumble. It’s what we’ve been doing in Seattle for decades. Try telling Metro they can’t run the 48 down 23rd, because it’s not poured concrete. The tradeoffs are between access and speed and reliability. But sometimes, the decision is for access and not for speed. the BC routes could be on 148th Avenue SE and be faster still. This would not require rebuilding a street and providing new sidewalks. Route 60 could skip the VAMC driveway. Further, Route 39 need not extend to and from downtown Seattle; the main connection to the VAMC could be via Link and Route 36. Route 42 riders could tranfer between Route 8 and Link. Route 345 need not deviate into Northwest Hospital. There are more. Every bus stop is a deviation from forward movement. What is the optimal stop spacing?